To read part 1 of this article, which was published on Tuesday, click here. We continue with some considerations on the ordering principles of a canon for liturgical art. As I write this, I have just returned from a short visit to the Norbertine Canons Regular at St Michael’s Abbey in Orange County, California. I was talking about this topic with them, and one of their seminarians made the point that the Roman Canon ought to be a crucial. I realized that this is the text, perhaps more than any other, that will characterize the Roman liturgy and will contribute its distinctive imagery, differentiating it from other Rites. The Saints and the particular Old Testament archetypes referred to in it could be portrayed pictorially. 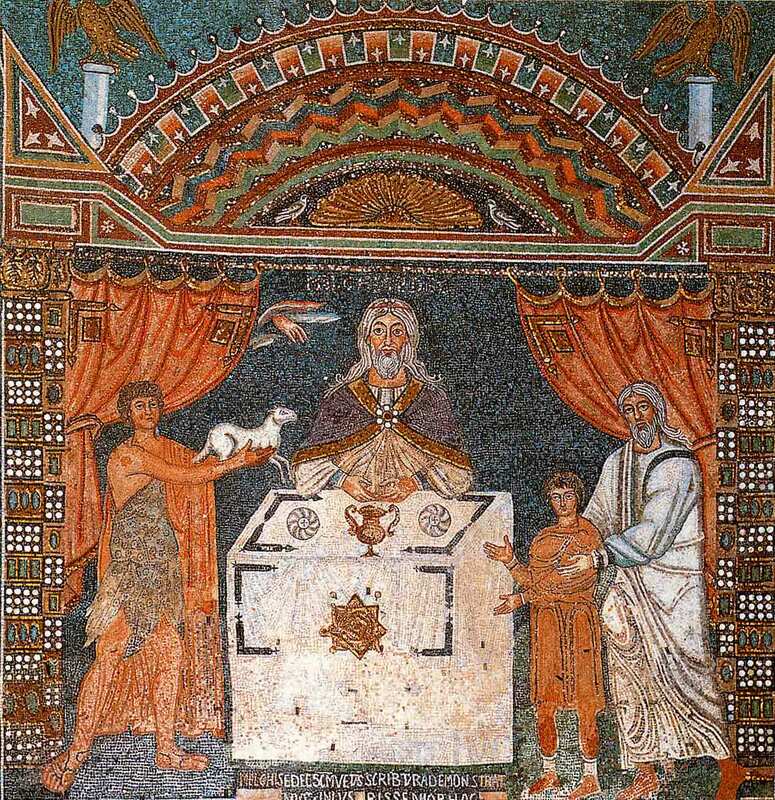 For example, here is a 6th-century mosaic of the three sacrifices, those of Abel, Melchizedek and Abraham, in the church of Sant’Apollinare in Classe just outside Ravenna. I suggest that the schema for iconostases should be studied in such a way that we can understand how they are formed by the liturgy. I would be looking at the images contained therein, and how their relative positions enable the worshipper to interact with Saints portrayed and be engaged with the mysteries represented. To take just one example, something that was pointed out to me recently by Melkite priest Fr Sebastian Carnazzo of St Elias Melkite Catholic Church: at the centre of the iconostasis are the Royal Doors, which are opened periodically during the Divine Liturgy. These usually have icons of the Annunciation. By this, Mary the Mother of God becomes the portal, so to speak, through which the Word is made flesh. The image above is a modern example from a church in St Petersburg, based on a 14th century Greek image, with the addition of peacocks which symbolize eternal life. When the doors are opened, we see the altar, and so the two are connected in our minds. I found the image below of Holy Resurrection Melkite Catholic Church in Columbus, Ohio, in which the large image of the Mother of God, here behind the altar, reinforces the point that her Son is between us and her. There is no image of the Resurrection itself, but the Risen Christ is visible nevertheless, is seen with the eyes of Faith on the altar. In Chapter 8 of his book, The Orthodox Liturgy: The Development of the Eucharistic Liturgy in the Byzantine Rite, Anglican clergyman Andrew Wybrew discussed how the iconostasis developed in conjunction with the liturgy, and by the 14th century was set in an established pattern. There are a number of ordering principles at work, but generally, other things being equal, those images that are most prominent in the hierarchy will be more centrally positioned and placed physically highest in the church building. The architecture of the building and the layout develops so as to harmonize with this. In parallel with this study, we should examine such schemata where they occur in the West, look for similarities and differences, and try to account for them. 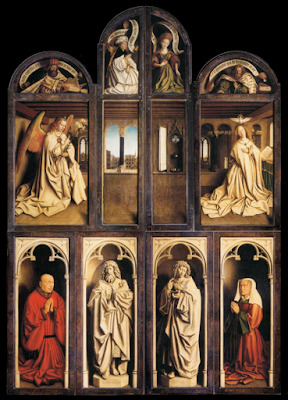 Consider, for example, the famous Ghent altarpiece from the 15th century; this is a reredos, and so, in contrast to the above, would have been situated behind the altar and not in front of it. 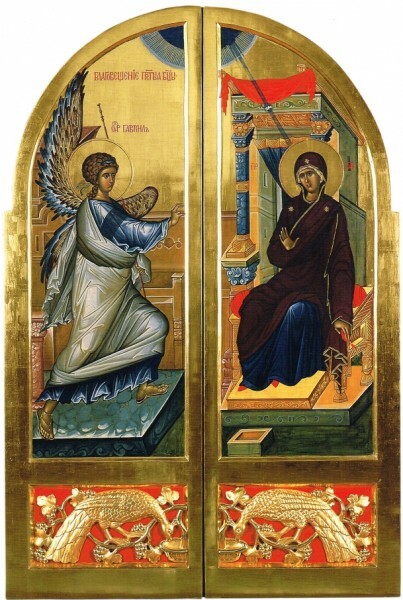 Here too, the Annunciation is the dominant image. In addition to the prophets and patrons, there are St John the Baptist, who proclaimed the Lamb of God, and St John the Evangelist who described the moment in his Gospel. Two of the Marian anthems sung after Compline, the Alma Redemptoris Mater and the Ave, Regina caelorum, speak directly of Mary as the doorway, the door of morning, and heaven’s gateway. These are sung in Advent and Lent, the seasons which anticipate the coming of the Lord and His Resurrection . 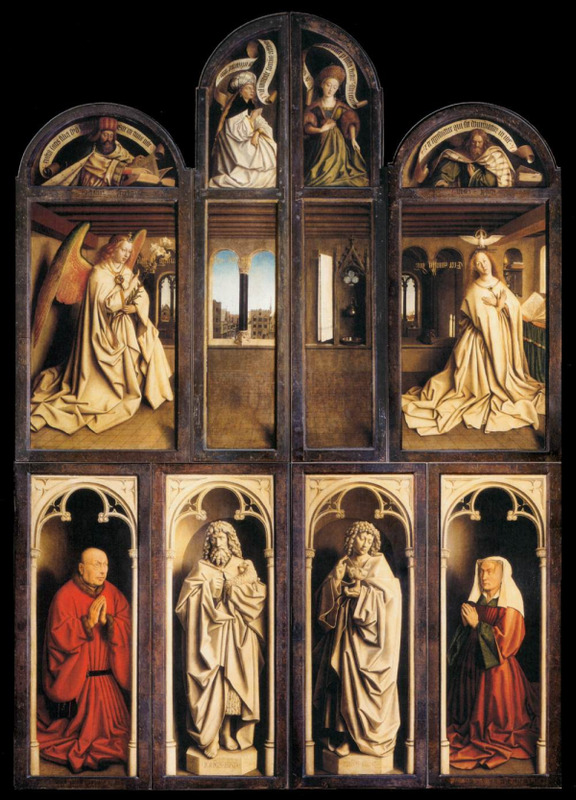 I wonder if this connection was made with this painting by the congregations of 15th century Ghent? The reredos will not have been the only set of images in the church. Most likely a rood screen was in front of the altar, and that will have had a crucifix. This highlights one difficulty of studying past schemata; paintings are moved or destroyed, and so we don’t know what was there originally. 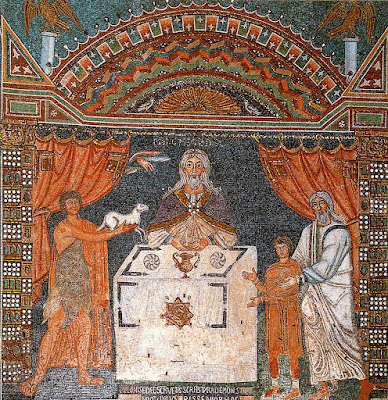 Mosaics might be the best indication we have of original arrangements. We know only too well today that churches are constantly re-ordered; many offer an assortment of art which reflects the favorite devotions and taste of the last pastor or patron, and are not an indication of tradition. Many Roman Catholics do not have the facility of worshipping in conjunction with images in the way that one might see in an Eastern liturgy. I don’t know what is cause and what is effect here. It might be that the style of worship for a long time, the last couple of centuries perhaps, has been such that there is so little engagement with the art, and thus, little point in having many liturgical images. It might be that the emphasis on devotional imagery in churches has meant that the liturgy itself has become disengaged from its surroundings, because there was less and less opportunity to engage with art during worship. Regardless of the reason, we have a situation today where even if great care is taken to choose beautiful, high quality art, and even if the liturgy is celebrated well, there is rarely a connection between art and worship. The art and architecture becomes at best a beautiful backdrop which creates an atmosphere appropriate to what is going on, rather than an integral part of a beautiful and gracefully liturgical “machine” in motion. I suggest that thought needs to be given to how we can adapt the celebration of the Mass so that there is greater engagement. Clearly this needs to be done with care, and I would hesitate myself to make many suggestions as to exactly what could be done during the Mass itself. I would rather leave that to liturgical specialists. I do offer a few thoughts for consideration, however. For example, the Eastern practice of putting out an icon of the day’s feast, or on related to the readings, could be adopted so that all see it as they come into the church. Then, perhaps, on processing in and out of the Church, it could be incensed and venerated. The homily could reinforce this by referring to the image - “this is why we venerated it when we came in,” etc, Furthermore, there could be processions round the church building itself before or after Mass at which the images appropriate to the liturgical calendar are venerated and incensed. Congregations would develop the habit of noting which images were appropriate to any particular day, and those thoughts would be with them during the Mass proper so that at the mention of, for example, the saint of the day during the Collect they would instinctively turn to look at the image. I have pointed out in the past that I do not see how any artist can realistically expect to paint art that connects with prayer if he is not habitually praying with art himself. With this in mind, I have tried to develop the habit myself during Mass of turning to face the statue or painting of the saint at the moment he or she is named. Similarly, if we are addressing the Father in prayer, as in the Our Father, I try to remember look at the image of Christ, so that I address my prayer to the Father through the Son, the “image of the invisible God”, in the Spirit. I have an icon corner at home, so that when I pray the Liturgy of the Hours, I do so in conjunction with imagery. The book The Little Oratory was written to help lay people develop this habit of engaging with imagery in the context of the liturgy, in the hope that they might subsequently bring this habit with them when they pray the Mass. There is something else that I would ask from artists and patrons. Don’t make the symbolism of your art obscure. Liturgical art is supposed to clarify, not mystify. If someone ever wrote an article on the hidden meaning of my art, I would be flattered that it should merit such interest, but also dismayed. I don’t want meanings to be hidden, I want them to be apparent. So, artists, I say to you: give as much information as you can on the painting to instruct people as to why it is there. This goes against the grain for many creative types. In my experience, they don't like giving explanations of the meaning of their works, preferring to keep them hidden behind a shroud of mystery and ambiguity, in order to maintain an aura of intellectual aloofness. In the context of a church, this is inappropriate; we want clarity and transparency. If necessary, add script to the image in the spoken language of those who will see it, and supply an explanation to the patron. For example, write Scriptural quotes, or references and titles not just of the image as a whole, but also of its constituent parts. To take just one small example, this is a wonderful painting of the Baptism of Christ which is appropriate for a baptistery. When Israel came out of Egypt, and the sons of Jacob heard no more a strange language, the Lord took Juda for his sanctuary, Israel for his own dominion. The seas fled at the sight they witnessed, backward flowed the stream of Jordan; up leapt, like rams, the startled mountains, up leapt the hills, like yearling sheep. What ailed you, seas, that you fled in terror, Jordan’s stream, what drove thee back? Why did you leap up like rams, you mountains, leap up, you hills, like yearling sheep? Let earth thrill at its Master’s presence; it is he that comes, the God of Jacob, who turned the rock into pools of water, the flint-stone into a springing well. 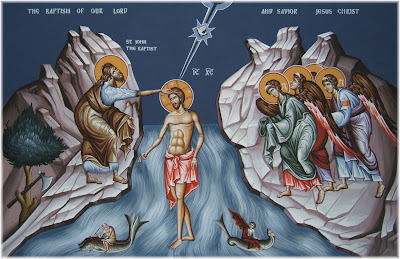 People are more likely to understand that the earth thrills because by his Baptism, Christ has sacramentalized, so to speak, the spring waters that emanate from the rock, which is the Church, and by which our baptism will purify us as we die spiritually with Christ, to be spiritually resurrected, in Christ, in Confirmation. 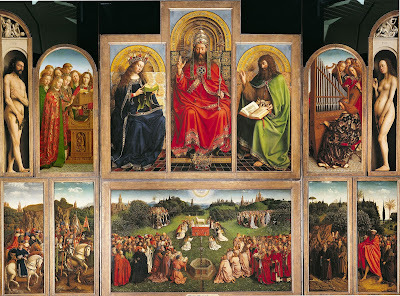 If you look at details of the Ghent altarpiece above, you will find many painted excerpts from scripture. Today’s Catholic needs more help with this than his 15th century counterpart (I know I do! ), so today we should see more writing on our pictures, not less. As a result, every member of a parish church would become a catechist and an evangelist, one who could give the neophyte or visitor a tour of the church through which he would explain the essential elements of the Faith through the images. Recently I was given a explanation of the design of the Gothic cathedral at Salisbury in England, in which it was pointed out that it was unusual for a non-monastic church to have a covered cloister. It was there, I was told, because of the special nature of the Sarum liturgy, which originated there. 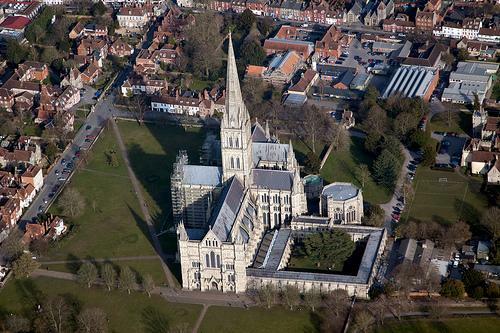 Sarum is the old name for Salisbury). It had many processions, which took place in the cloister - a covered walkway built with the English rain in mind! It occurred to me that as liturgical action develops to engage art, this will not only effect the style of art, the content of the images, and the combination thereof which we see in churches; it will also affect the architecture of new churches, just as the Sarum liturgy affected the design of this cathedral. Perhaps if processions are the way, we might see a re-emergence of the cloister or covered walkway. Then we could have a planted garden of Eden in the quadrangle, which would be seen by those who process into the church, where they will be greeted with a pictorial, architectural and musical rendition of the New Jerusalem and paradise restored. Alternatively, we might see new but liturgically authentic architectural developments that characterize our age that are previously unimagined. For those who are interested in knowing more, the curriculum of Pontifex University’s Masters in Sacred Arts is designed with these principles in mind. The Pontifex MSA gives its students the Scriptural knowledge and understanding of liturgical principles in relation to imagery by which, we hope, the new schema will emerge.